Since February 2006 VENUS has been collecting data on one of the first advanced ocean observatory systems. This full length time series from Saanich Inlet reveals seven full seasons of variability. The time lapse captures changes on the seafloor in Saanich Inlet at 96 metres depth as recorded by a VENUS camera in May 2012. The New Scientist featured a story about Drs. Gail Anderson and Lynne Bell (SFU) research on VENUS. Using data collected between Dec. 2011 and Apr. 2012 from an Ocean Sonics low frequency hydrophone that was deployed at the VENUS Strait of Georgia East site, this publication assesses various methods for averaging local shipping noise levels. A recent paper examines the response of the benthic animals to changing levels of oxygen. A group of researchers have successfully identified a new dinoflagellate species. Part of the large group of eukaryotes (approx. 1555 species), the new species has distinct morphological characteristics and was named Archaeperidinium saanichisp.nov. after Saanich Inlet, the place where, using a VENUS sediment trap, Dr. Vera Pospelova and her MSc student – Andrea Price collected samples and conducted their research that led to a publication in Marine Micropaleontology (see reference below). A magnitude 8.8 earthquake struck Chile in February 2010, generating a tsunami that crossed the Pacific, with measurable waves recorded throughout coastal British Columbia. A recent paper, published in Pure and Applied Geophysics, describes this tsunami in detail and compares it to the Great Chilean earthquake and tsunami of May 1960. It’s hardly been a case of “all play and no work” for Wally the Crawler. 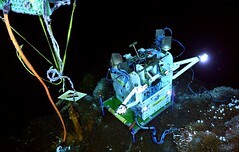 Researchers in Germany and Canada have been making heavy use of Wally and the unique data this deep-sea crawler gathers among the gas hydrates outcrops of Barkley Canyon. A recent paper published in the journal Geophysical Research Letters details their recent findings, which have implications for changes we may expect as Earth’s climate warms. Image captured by VENUS camera in Saanich Inlet in mid June. Dungeness crab mating is a complex affair. An intense windstorm left thousands of Vancouver Islanders out of power and forced BC Ferries to suspend service to the mainland on the 22nd. Wind gusts exceeding 110km/h were recorded in places, as a train of intense low pressure systems struck Vancouver Island's west coast one after another. Data from Folger Deep revealed some interesting trends. At storm onset, oxygen concentrations increased significantly, probably due to mixing from wave action, and then levelled out. Water temperature also increased during the early stages of the storm. Salinity, on the other hand, dropped throughout the event. Acoustic Doppler Current Profilers (ADCPs) are instruments used in our subsea network and other oceanographic applications to measure the currents. We collect data from two types of ADCPs, manufactured by Nortek and RDI. These ADCPs use “sound beams” to measure water movement. Sound pulses are sent out in three or four different directions from the instrument; when sound waves strike suspended objects such as tiny particles or zooplankton, some of the energy is reflected back to the ADCP where it is detected by the instrument’s transducers. The received signal intensity gives an indication of the abundance of particles within the water. The Doppler shift of the received signal for each beam is used to determine the current velocity. Hydrate Growth at Bullseye Vent? Gas hydrates are ice-like solids composed of natural gas, usually methane in marine environments, and water. Hydrates are known to exist in the Cascadia margin, west of Vancouver Island, beneath the seafloor. Sediment stiffness is increased by frozen hydrates, like ice in winter mud. The degree of stiffness is an indicator of the amount of hydrate present per unit volume. Gas hydrate outcrops, venting and topography in the Cascadia margin have been intensively studied and are observed to change over time. Does the volume of hydrates also change with time? University of Toronto researchers Lisa Roach and Nigel Edwards are trying to find out. Wally the Crawler underwent the ultimate stress test on Sunday. After entering the water tethered beneath the Remotely Operated Vehicle ROPOS, strong waves apparently sprung Wally loose. He took an 870 m free dive from the sea surface to the seafloor at Barkley Hydrates. Wally the Crawler dangles below ROPOS just prior to entering the ocean at Barkley Hydrates, 18 September 2011. Detection of a Large Salmon Run? The Zooplankton Acoustic Profiler (ZAP) located at the base of the slope of the Fraser Delta recorded this hourly image of echo-sounder data on September 5, 2011 ( just after dusk and at rising tide). The image reveals a dense school of large fish between 10 and 20m depth, and many individual fish between 20 and 80m depth. This East Pacific Red Octopus (Octopus rubescens) was observed by our camera in Saanich Inlet. This octopus is found from the southern Gulf of California to the Gulf of Alaska. O. rubescens generally grows to a mantle length of 8-10 cm and up to 400 gm. On Saturday, Feb. 27 2010, 0634UTC, a magnitude 8.8 earthquake occurred off the coast of Chile. A tsunami advisory was issued for the BC coast. According to the USGS, "this earthquake occurred at the boundary between the Nazca and South American tectonic plates. The two plates are converging at a rate of 70 mm per year. The earthquake occurred as thrust-faulting on the interface between the two plates, with the Nazca plate moving down and landward below the South American plate."